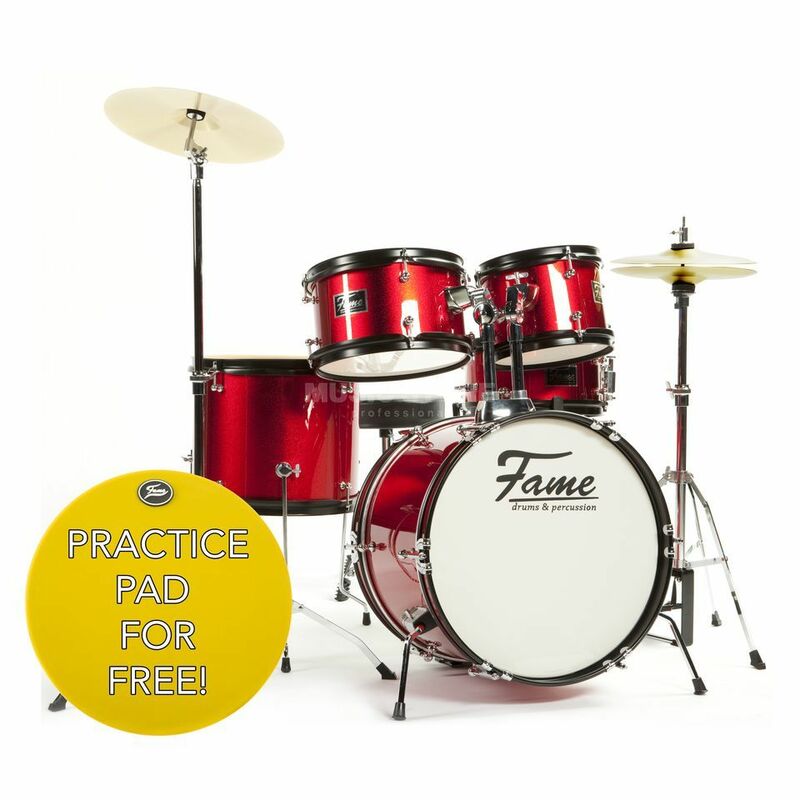 Size tom 2: 10" x 6"
Kiddy Drum Sets from Fame are perfect for young protégés and future rock stars. These under-sized kits are ideal for children between the ages of 3 and 6 and offer as much fun and learning as they appear. The Kiddy Drum “Elias” comes equipped with all the same components of a “real” kit; everything is just slightly smaller than usual. Included are 2 TomToms, in 8” and 10” sizes, a 12” Floor Tom, the Bass Drum measures 16” and a 10” Snare Drum. A cymbal, hi-hat and snare stands as well as a small foot pedal, make up the hardware package. Two brass cymbals; a 12” Crash and 10” hi-hat, as well as a height adjustable stool and a pair drum sticks ensure that this complete package contains everything you need to get started with away. Toms and Snare Drum are tuned with flanged steel hoops, except the Bass Drum which features a robust hoop made from plastic. The steel hoops are powder-coated black, giving the shells a great look together with the sparkle finishes. The lugs are classically chrome-plated, as is the stand hardware. The height adjustable stool has a round seat with a robust vinyl cover. The shortest is 33cm and the stool stands 42cm at its tallest. The Tom holder as well as the cymbal stands features a toothed-tilter, promising secure hold and flexibility. The little pedal is similar in construction to popular full-sized pedals and is equipped with a felt beater. Size floor tom 1: 12" x 10"
Snare size: 10" x 5"
Size bassdrum: 16" x 11"
what i like about the drum set is what it looks like its really neat and tidy and the quality of the sound is just in aww thanks music store for hitting me up with this set i love your company Godbless you!